When developing a composition sometimes it all comes together just as I envisioned--but not always. When things aren't going as smoothy as I would like, it's time to revisit my color theory skills and make them work for me. Perhaps knowing my process will help you. I begin by identifying the colors already used, based on their parent hue, which allows me to assign their position on the color wheel. From there I can determine which potential color schemes could include these hues. Once the viable combinations are established it is simple to identify additional hues that fit within that harmony. Ah, success! How would you go about selecting a pleasing combination? Are you familiar with the color wheel? Are you well versed on the various harmonies that are possible? Now it's your turn. Let's assume for a moment that you've followed the process described. What if the color you want to use just won't fit with other hues within your chosen color scheme? Take a look at nearby hues that do fit within a color scheme that includes the hue(s) you want to incorporate. It could be as simple as shifting a color a little warmer or cooler, such as using blue-green instead of blue or shifting pink to coral. The problem is that, unless you are well versed in the various color harmonies one can pull from a color wheel you are stuck. Some consider learning about color to be a chore but, in fact, the opposite is true. Learning about color, how to control it and make it work for you is very liberating. When you understand color theory you have the knowledge to apply your skills to all aspects of color in your life and surroundings including home decor, fashion, art--anywhere colors abound. It is easy to become familiar with color. There are two classes that you can take to cover everything that I've mentioned and more. 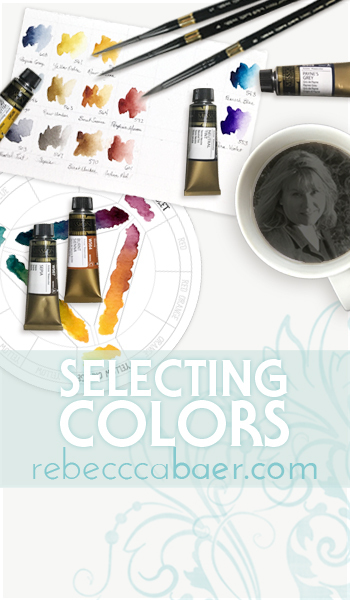 The first is "Making sense of Color", which familiarizes you with the color wheel and mixing. I am a big proponent of knowing "why" you make certain choices. Anyone can tell you to mix color "a" with color "b" to create color "c" but, unless you know "why" each color is selected for the mix, you will forever be dependent. You only need to understand what is needed to reach the desired outcome to become color proficient and learn to mix your target hues. The second course that I suggest is "Understanding Color Harmony", which is an in-depth look at color schemes. This equips you with what you need to know to modify existing, or create new, pleasing color schemes. Both courses are easy to follow and include printable worksheets to allow you to paint along and reinforce the lessons. Your access never expires so you have the freedom to work at your own speed and repeat the information as often as you like.